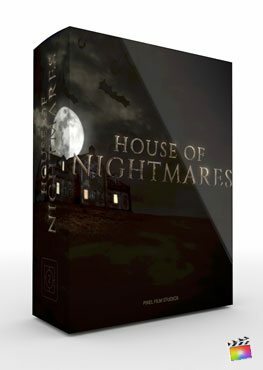 Murder Upstairs comes with scene presets that feature up to 3 drop zones per environment, and fully editable 3D text. First, position and rotate each drop zone within the scene. Then, place the text anywhere to get the desired layout. Creating a layout is fast and easy using Murder Upstairs. 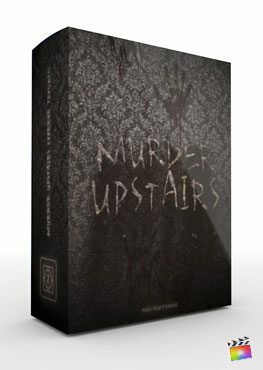 Murder Upstairs comes with a multitude of controls for users to play with. FCPX users can set up the camera movements, change the angle of view, add blurs and more. Adjust the position and rotation of the camera positions throughout the entire scene, creating unique movements. Users are able to set a starting point, mid point, and ending point for the animation. Murder Upstairs includes Transitions, Lower Thirds, and fully editable 3d text. FCPX users can change the font, thickness, outline, edge style, and much much more. All text includes keyframe-less intro and exit text animations, allowing users to select animations from a simple to use drop down menu. Bring your next project to life using the built in animation options. All adjustments to Murder Upstairs are made using the thorough control rig found in the inspector window. Controls are broken up into groups like Camera Controls, Drop Zone Controls, Text Controls and more. Murder Upstairs has everything editors need to create a epic movie inspired slideshow in Final Cut Pro X.